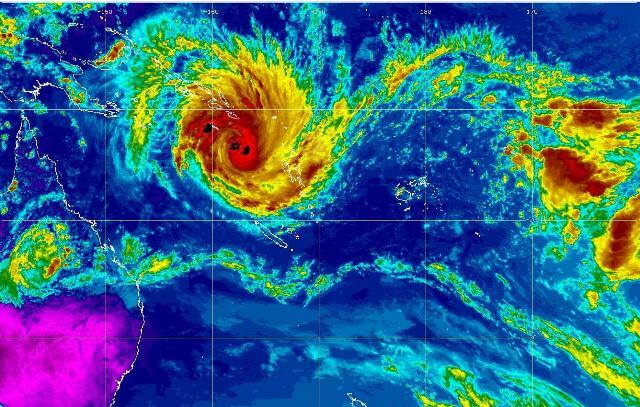 Thanks for your well wishes as Cyclone Anthony approached the coast of Queensland. The good news is that it passed quickly to the south of us with minimal impact on the area. This system has already been described as one of the biggest threats to ever menace our state. It’s difficult to see how we’ll avoid this one. A disaster zone has been declared before it has even arrived. To say we’re all feeling rather anxious is more than just an understatement. It’s going to be a long night of weather watching at my place. We’ve tidied the yard, filled the cars with fuel and recharged phones. Now we wait to see what the night brings. My son – receiving a busary for his school studies. Wonder where that smart-mouth comes from? Imogen attempts to blow out the candles and Joseph misses out on blowing out the last candle. Instructions fly left, right and centre. 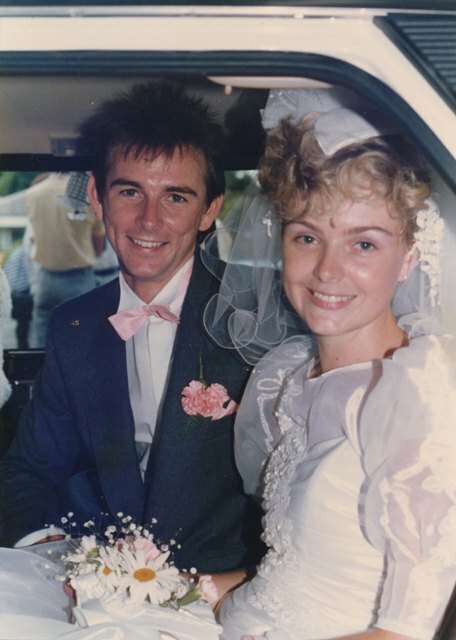 Is it any wonder I’m slightly insane…? Look at the goomba I bought. 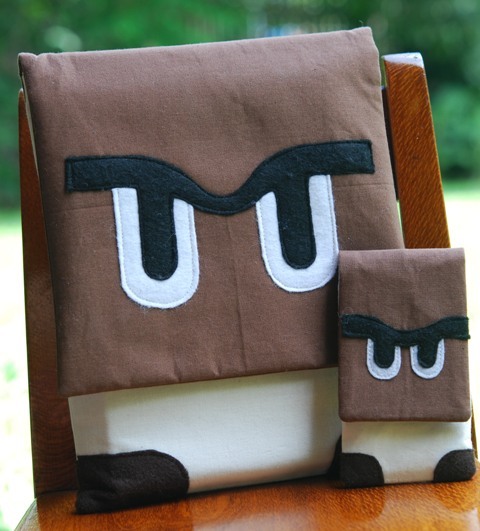 I’ve never really played Mario, but as soon I saw these goomba with their cranky little faces I loved them! I bought them from a clever crafter in Melbourne via Etsy. 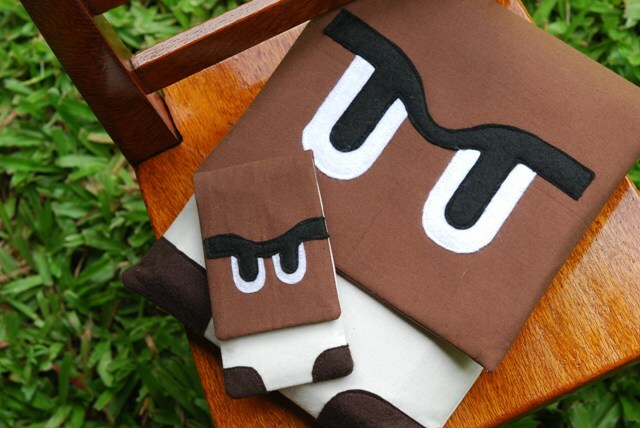 I love the thought of them being made by someone on their sewing machine at their home. I love that trawling etsy can feel like visiting a really cool craft market and walking along inspecting the stalls. I love the internet! 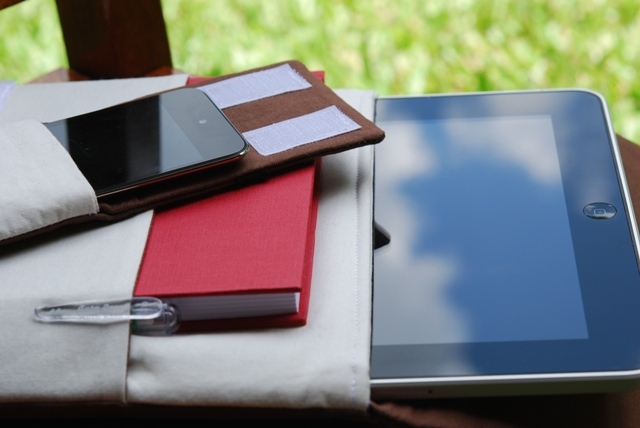 iPod in one, iPad in the other. They both fit neatly into my bag so I can see their angry eyes wherever I go. Congratulations to Melody, who was the winner of the Millie Molly Dolly bag auction. She has already paid $225 to the Premier’s Flood Relief Appeal and her bag will be sent to her tomorrow. I’m certain that her girls will love it! As the leading bid for the Millie Molly Dolly bag auction grows larger I have begun to feel that she really requires something special. In searching through my fabric stash I found some denim look quilting fabric. So today I made her a few extra outfits that my Pete likes to call “The Denim Range”. 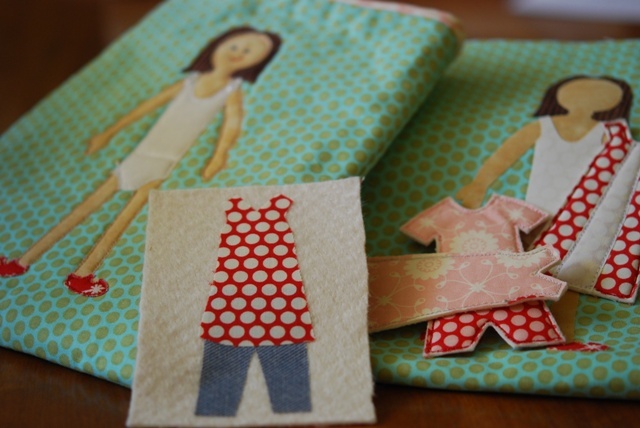 The winner of the auction will find ELEVEN outfits tucked inside the bag for Millie Molly. Not one of these outfits will ever require ironing. Perfect! Don’t forget to visit Toni’s blog to see the master list of auctions and raffles. Last week the flood appeal auctions had raised over $45 000. That is astounding! Wouldn’t it be nice to be in Paris in the spring time? To stand beneath the Eiffel Tower and dream Parisian dreams. I have no idea what Parisian dreams are, but they sound terribly fancy. 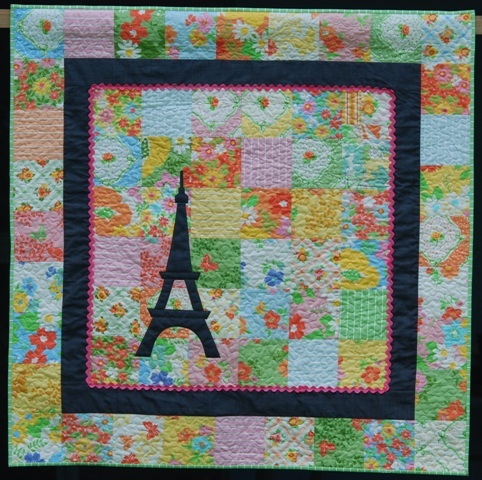 This little quilt is called Dreaming of Paris. It continues my mild case of obsessive ricrac disorder. I’ve used a two charm packs of Dream On by Urban Chiks. 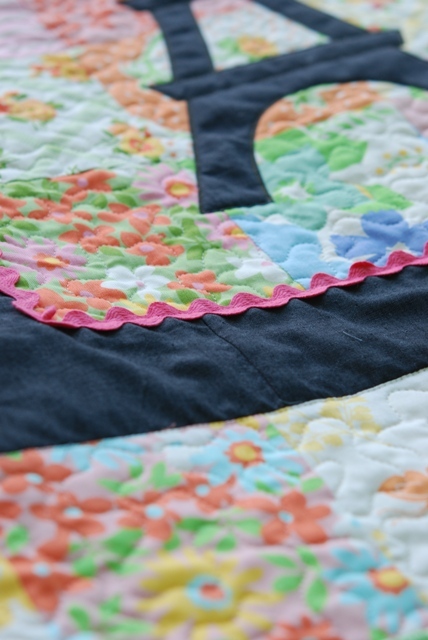 These fabric designs were based on vintage sheets. A dark grey silhouette of the Eiffel Tower looks beautiful against their floral goodness. 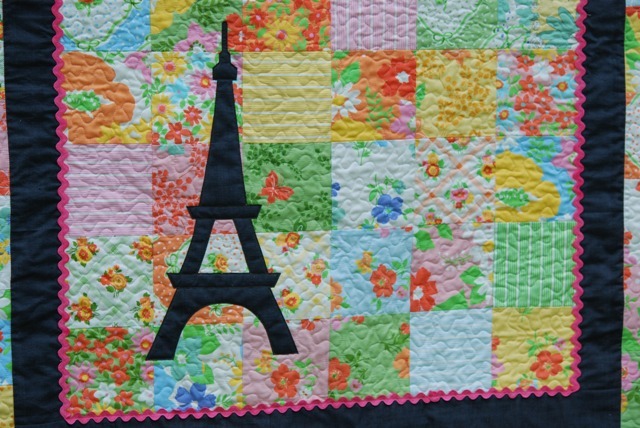 Today I am happy to offer this design – Dreaming of Paris – to you as a free download. Just click here to download a free pattern. If you do download this pattern won’t you please consider taking the $5.00 that you might have paid me for the pattern and donating it to the Premier’s Flood Relief Appeal. You should also pop over to Toni’s blog and see the amazingy long list of wonderful crafty items available for auction and raffle. The raffle on this blog for a Millie Molly Dolly bag has already reached $200 (amazing! ), but it will remain open until the 24th of January. Lots of new readers have visited this blog in the past week, looking at the raffle. Hello to them!